(CNN) For too long, foreign investment in Africa has taken a short-term perspective that values extracting commodities over adding value. Whether from East to West, investment is often a one-sided affair which is a proxy for global politics. Exceptions have been some of the international consumer goods companies who have recognized the depth of the opportunity and the need for investment in local production and talent. Even more important has been the recent rise of African business of real scale and ambition with the capacity to go global. As these businesses illustrate, the real source of untapped value in Africa lies on the surface of the continent, not underneath. However, harnessing this value requires a new approach to investing: shifting from a narrow focus on a single business or project to broader elements of the business ecosystem that impact the success of investments. And quite frankly, the United States is at risk of being left behind in this area as other countries expand and deepen their ties throughout Africa. 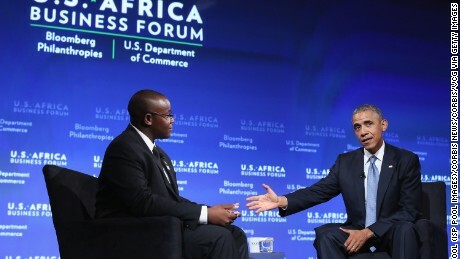 This week, President Obama will host his second and last U.S.-Africa Business Forum in New York, co-hosted by Bloomberg Philanthropies and the U.S. Department of Commerce. It is one of several legacy initiatives of the Obama Administration, including Power Africa and the Global Entrepreneurship Summit (GES), designed to focus U.S.-Africa relations away from assistance and towards equal partnership and shared prosperity. During the inaugural Forum in Washington, D.C. in 2014, new relationships were established, and the focus was moving from the role of the public sector in Africa's development to that of the private sector. The change in location from the U.S. capital to its financial center is well considered to allow for the engagement of global financial leaders. As we look to this historic gathering, and indeed further into the future, to the next administration's U.S.-Africa policy, we should consider two goals for business partnerships between the U.S. and Africa. First, identify those areas where U.S. policy can help American companies more easily capitalize on opportunities to invest in local ecosystems rather than a single business. Second, create the space for U.S. and African firms to build strategic, long-term partnerships in order to ensure all critical elements of local value chains are operating efficiently and reliably. As a long-time investor across Africa, the question I am most often asked by my peers abroad is not whether to invest in Africa, but how to do it. Investment in Africa should work across value chains -- and create new ones. For example, instead of focusing on one business, like a flower grower, commercial interests should consider the entire local value chain: refrigerated transport, cold storage, access to power, and efficient access to points of export. Otherwise, even the healthiest crop will fail to reach its intended market before wilting and losing value. Investing in ecosystems rather than a single project is, at minimum, an insurance policy. At best, it increases the overall return on investment. Capturing value chain opportunities, for example by establishing and controlling distribution, can be a real source of competitive advantage. This approach also has the greatest impact on the economic development of the areas in which it is employed. Value-added investment beyond natural resources is necessary due to several trends shaping Africa today: the growing population of working-age adults, rapid urbanization, a growing consumer class, stronger democracies and public institutions, and increasing agreement that the private sector should lead Africa's economic growth. These trends combine to increase demand and generate high growth potential for sectors such as energy, healthcare, education, and infrastructure. The good news is that diversification is well under way as policymakers across the continent strive to build the capacity for strategic sectors to move up the value chain. It is no coincidence that broader based economies, such as Kenya and Ivory Coast, continue to thrive and grow. The US and other developed country partners have an important role to play in this transformation by rethinking their own approach to development assistance to focus more on nurturing African entrepreneurship, which will allow local firms to play a more productive role in globalized value chains and contributing to economic and social development. The American private sector should also be engaged with entrepreneurs and small-medium enterprises in Africa. Connecting these businesses with international capital can be difficult, since they are often family-owned and under the radar, which is what makes international gatherings like the U.S.-Africa Business Forum so critical. I am pleased to see the U.S. Department of Commerce make a special effort to include entrepreneurs and smaller businesses in this year's Forum. Now it is time to turn these discussions into concrete action. I hope the commitments that come out of this year's U.S.-Africa Business Forum -- and U.S. policies in the months and years to come -- will focus on long-term investments that address entire ecosystems and value chains, not just single extractive projects. This will lead to the kind of meaningful and lasting change that benefits both Americans and Africans alike.